In about a month, football fans may be pleased to learn that Paul Gascoigne (aka Gazza) will be hosting a dinner here in little old Muscat. 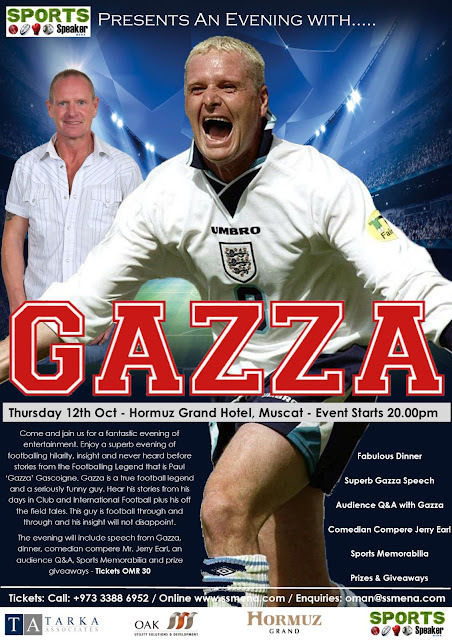 The dinner starts at 8pm on Thursday 12th of October at the Hormuz Grand Hotel and will consist of a dinner followed by a speech from Gazza and a Q&A with the audience. A comedian compere Jerry Earl will also be providing entertainment. All the usual sports memorabilia and prizes / giveaways are on offer as well, and it should be a fun night. Tickets are RO 30 for dinner, and drinks deals will be available throughout the night.